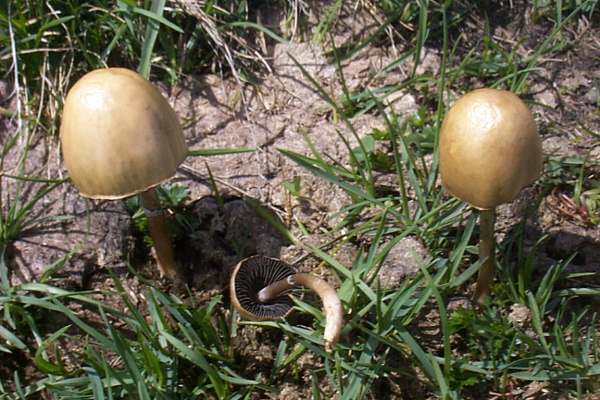 Panaeolus semiovatus, the egghead mottlegill, is invariably found on dung or on recently manured soil and can appear at any time of year provided the ground is not frozen. 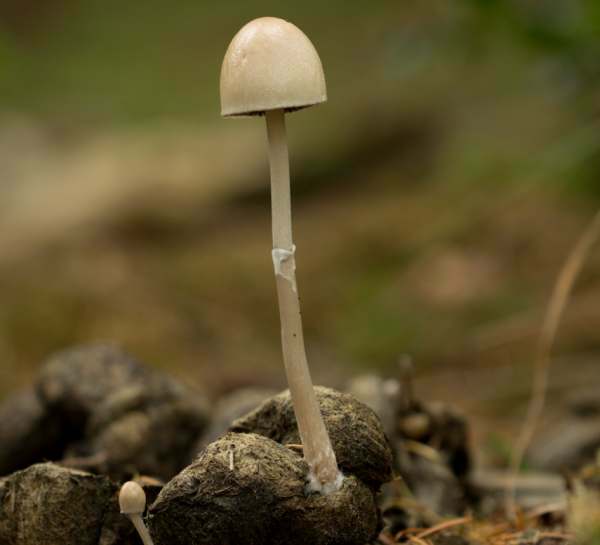 This dung-loving (coprophilous) mushroom is widespread and fairly common throughout Britain and Ireland as well as in other European countries. Panaeolus semiovatus is also native to North America, where it is equally plentiful. The basionym of this mushroom dates from 1798 when it was described scientifically by British naturalist James Sowerby (1757 - 1822), who gave it the binomial name Agaricus semiovatus. (Most gilled fungi were initially placed in a giant Agaricus genus, but the majority have since been redistributed to other genera leaving the 'true mushrooms' in Agaricus.) 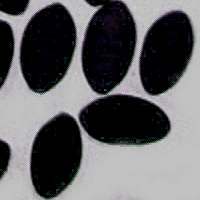 It was not until 1938 that the Egghead Mottlegill obtained its currently-accepted scientific name; that was when American mycologist Seth Lundell (1892 - 1966) transferred this species ito the genus Panaeolus. 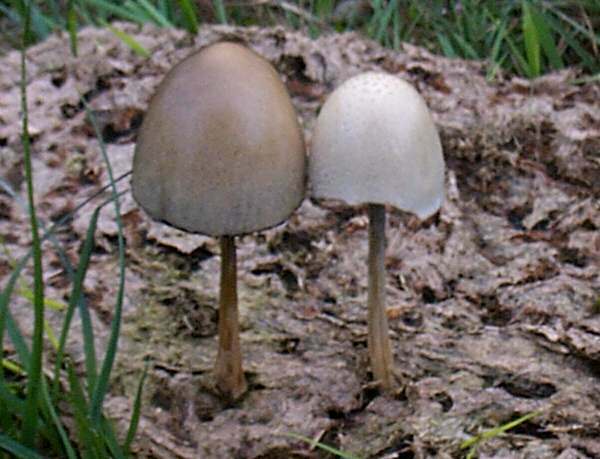 Synonyms of Panaeolus semiovatus include Agaricus separatus L., Agaricus ciliaris Bolton, Agaricus semiovatus Sowerby, Coprinus ciliatus (Bolton) Gray, Coprinus semiovatus (Sowerby) Gray, Panaeolus separatus L.) Gillet, Anellaria separata ( L.) P. Karst., Anellaria separata var. minor Sacc., Anellaria fimiputris, Panaeolus fimiputris, and Anellaria semiovata (Sowerby) A. Pearson & Dennis. There is no concensus about the correct taxonomic position of fungi in the genera Panaeolus and Panaeolina, which some authorities include in the family Strophariaceae and others in the Bolbitiaceae. Hemispherical or like half an egg (hence the specific name semiovatus); 2-6cm in diameter; clay coloured or cream-brown; drying smooth and shiny but tending to wrinkle in dry weather. 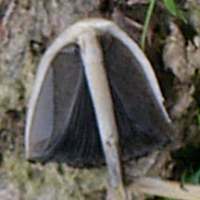 The thin rather brittle cap flesh is off-white. Off-white becoming mottled brown and darkening to black as the spores mature; often paler at the edge; adnate and crowded. The slender stipe (stem) of Panaeolus semiovatus is 5-15cm tall and 2-3.5mm in diameter. Although the lower two-thirds of the stipe is the same colour as as the cap, the colour becomes noticeably paler towards the apex. A white, fragile, superior upwards facing ring persists to maturity. 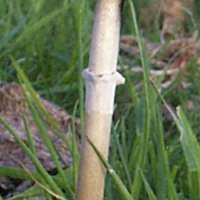 The stem flesh is pale yellowish and very brittle. 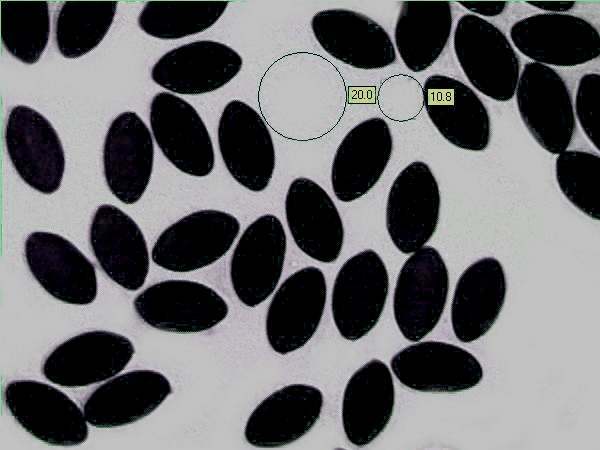 Pip-shaped, smooth, 16-20 x 10-12µm, with an off-centre germ pore. (A rare variety var. phalaenarium has a central germ pore; it is also distinguished from the nominate variety in lacking a stem ring.) . Saprobic, on or beside dung, particularly on upland meadows and common land where horses graze. Mainly May to November in Britain and Ireland, but these fungi can appear throughout the year if there is a spell of mild weather. Stropharia semiglobata, the Dung Roundhead, is more spherical, has a transient ring and leaves a brown spore print. 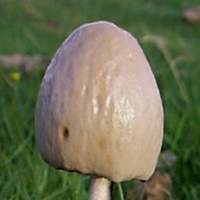 Some authorities say that the Egghead Mottlegill is an edible mushroom, but many more categorise it as inedible. In view of the fact that it is such an insubstantial mushroom (and it grows on dung!) and that there are concerns that it may contain the hallucinogen psilocybin, I must recommend that this mediocre mushroom be treated as 'only for viewing, not for chewing'.